Australian large businesses have proven themselves much better than smaller businesses at securing government financial assistance such as grants and tax concessions. Around 57 per cent of large businesses (i.e. 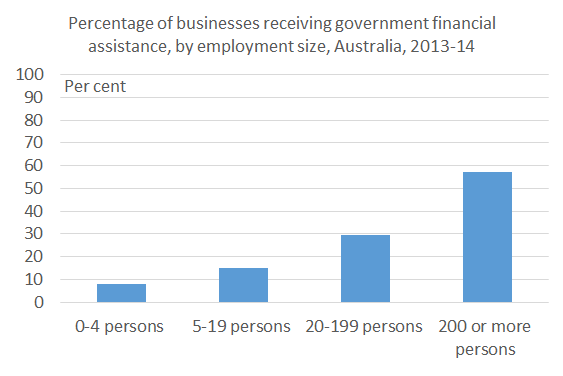 200+ employees) received some type of government financial assistance in 2013-14, compared with much lower percentages for small and medium-sized businesses (see chart below based on the ABS’s Selected Characteristics of Australian Businesses data). This huge disparity strikes me as very odd, and suggests our governments are providing industry assistance too liberally. It is very likely that too much assistance is directed at the big end of town, which has much less need for it than smaller businesses. This entry was posted in Industry policy and tagged abs, australia, business, corporatewelfare, grants, industryassistance, sme, smes, taxconcessions. Bookmark the permalink. Doesn’t that just show effective economies of scale are in the political marketplace? Yes, Apolitical, it certainly does. Thanks for the comment. I am sure a closer look at the numbers would expose business entities set up purely to exploit the subsidies and rebates. You don’t need to scratch the surface to deeply to expose businesses whose existence and whose business model is entirely dependant on the drip, drip , drip of tax -payer money. Prime examples being the wine equalisation tax, and the VET Fee Help, where entities are set up purely to exploit the system. Yes, I think it is a fundamental law, Katrina! Yes, alas there has been a lot of rorting of government schemes over the years. Thanks for the comment. Leaners! 🙂 Never underestimate self-interest.